A lot of my paintings contain stones, gems and metals that help give my work some beautiful texture, but there’s more to them than just their aesthetic qualities. Many ancient teachings from various cultures have taught us that stones contain energies within them: these energies affect the person who comes in contact with them. I use these materials to enhance the healing properties of my paintings. Most people don’t know all that much about gemstones, other than the vague idea that they might have something to do with birthstones. But I won’t get into that. 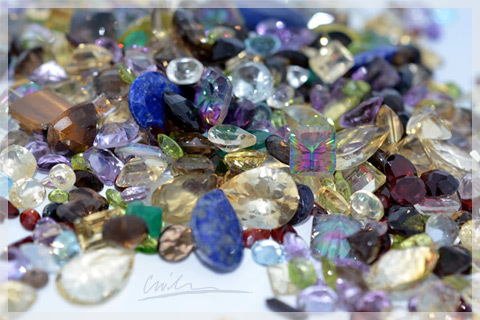 I rather like the idea that everything is connected in this world, and that things made out of nature can affect and enrich our lives on the most basic level, so instead I will focus on the general effects of each stone. That being said, here are some of the more common gemstones and the healing effect they have on people. Garnet, with its deep red pomegranate shape is a symbol of quick return of separated love, fertility and feminine force. It is also known to aid in the treatment of depression by acting as a heart and blood stimulant. Aquamarine: a beautiful blue gemstone whose name originates from the Italian word for seawater, stone is often associated with the thymus gland. It is very soothing worn as a necklace. Healers use it to help reduce fluid retention. It has also been used to calm the nerves. Agate is one of the oldest stones in recorded history. It is said to give inner strength and protection. It directly affects the solar plexus and is especially good to have around when you have an upset stomach. Citrine, is a bright and cheerful yellow stone which ancient cultures believed to be helpful in increasing psychic power. Today it is considered beneficial to the endocrine and digestive system. It helps with cleansing, purifying and eliminating poisons that have built up within the digestive tract. Quartz crystal is a clear variety of quartz that was first found high in the frozen mountains of the Alps. It is used to amplify the healing properties of other stones. It is said that if you give your lover a moonstone on a full moon, you will always have passion in your relationship. It’s no wonder then that moonstone is used by healers to stimulate the functioning of the pineal gland and balance internal hormone cycles with nature’s rhythms. Turquoise is one of the oldest protection amulets, and was also known as a symbol of wealth in many ancient cultures. This stone is said to Increase growth, muscular strength, alleviates pain and relax cramps. It also contains anti-inflammatory and detoxifying effects. Rhodonite is a soothing stone that promotes balance and wellbeing. It also helps in healing wounds and regulating heart circulation. I personally use many of these stones on a regular basis and completely believe in their healing and nurturing properties. I’d highly recommend that you try some of these stones out and see if they have any effect on your life. Never hurts to try right?